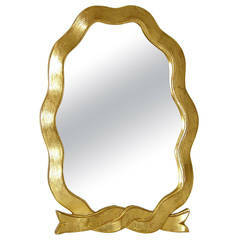 Ornate gilt table Vanity mirror, a lovely addition to any dressing area, bath or bedroom. Gold is in excellent condition with a rear brass protection. Sculptural relief perfection with sun burst and regal displays. 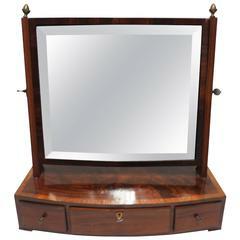 Italian, gilt wood vanity mirror for the table top with frame shaped like an undulating ribbon and scrolling stand. Please contact us if you have any questions. 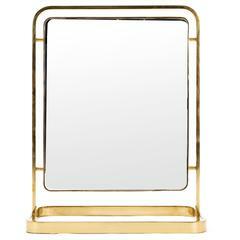 Large-scale table-top mirror by Paul Laszlo. 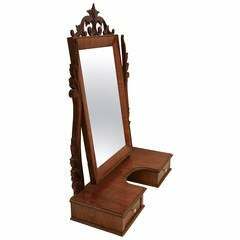 The mirror has a brass from that hold a two sided mirror. 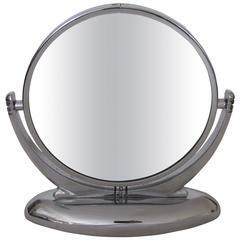 Large brushed steel standing round mirror from French department store.